A 747 jetliner, converted into a firefighting bird that can drop 19,000 gallons of fire retardant or water at a time, is one step closer to beginning operations in California for the first time, it was reported Sunday. 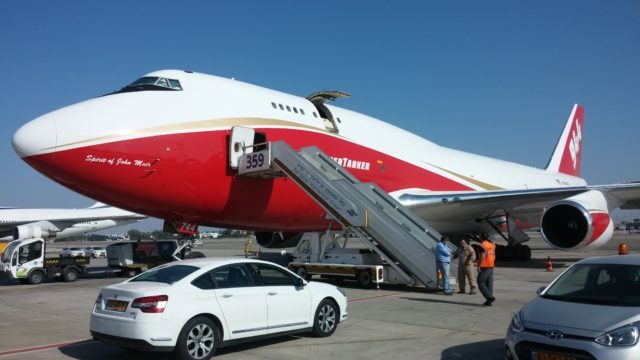 The “Global SuperTanker” has been used on fire in Chile, and a smaller 747 have been used to dump fire retardant or water on wildfires in California before. And a DC-10 tanker has been used to help put out fires from Malibu to Oregon as well. But the owners of a company that own this 747 had been frustrated this summer, as their request to rent out the plane at fires languished before federal bureaucrats. The web site fireaviation.com reported that the U.S. Forest Service has issued interim approval for the newer, bigger 747, which goes by the callsign “Tanker 944,” to be used in California. The company will have to reapply when the federal government publishes new rules for large aerial tankers on fire lines. CBS News had reported two weeks ago that the Global SuperTanker was caught in a paperwork mess, as the plane had been approved by the FAA last September and had been in use in foreign nations since then. But the U.S. Forest Service was only issuing permits for planes that could drop up to 5,000 gallons per pass, far below the 19,000 gallons that can be let loose by Tanker 944. “There’s a lot of cost involved in doing this, a lot of testing and a lot of paperwork, and I think that scares a lot of people,” said the Global Supertanker’s owner, Jim Wheeler, in a CBS Evening News interview two weeks ago. Tanker 944 actually got federal approval for interim use last January, allowing the plane to be tested and evaluated on fire in the United States. But that is rainy season, and the permit expired unexpectedly on June 15, the company said. In Washington, the USFS put out a statement that the interim permit is for 17 months “during which (Global SuperTanker) must take steps to ensure its 747 aircraft delivers retardant in a manner that is effective and efficient and aids firefighting efforts on the ground.,” aviationnews.com reported. The aviationnews.com site said the original 747-100 tanker plane was built by Evergreen Airlines in 2009, but it was retired when Evergreen went bankrupt. Global SuperTanker bought the hardware and the rights to the system, and installed it in a newer, more-powerful 747-400. The smaller DC-10, called Tanker 910, has reportedly been retired. A new Tanker 910 is now in service, as is a sister DC-10 called Tanker 912.